Baptist Health Imaging Center, 2705 Kentucky Ave., Paducah, Ky.
Baptist Health Paducah will host its fourth Spokes for Strokes bike tour to raise stroke awareness, along with funds for life-saving technologies and expanded stroke care services. 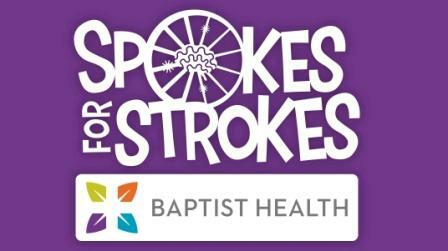 Spokes for Strokes will begin at 7 a.m. with registration at Baptist Health Imaging Center on the west end of campus at 2705 Kentucky Ave., followed by the tour at 8 a.m. Registration at active.com is $25 for an individual, $40 for couples and $50 for a family for four. The bike tour offers 10-, 35- or 65-mile rides through southern McCracken, Marshall and Graves counties. The longest ride includes challenging hills and five rest stops. The 35-mile ride is less hilly with three rest stops. The short ride is completely flat and stays in McCracken County. It includes one rest stop. All rides will be followed by support vehicles. Helmets are required. Stroke is the one of the nation’s leading killers and the leading cause of serious, long-term disability. For more information, phone 270.575.2851. This entry was posted in All the Buzz - Bee Informed, Just BEEcause and tagged Baptist Health, Benefit, Bike on May 1, 2015 by massacbeeswax.